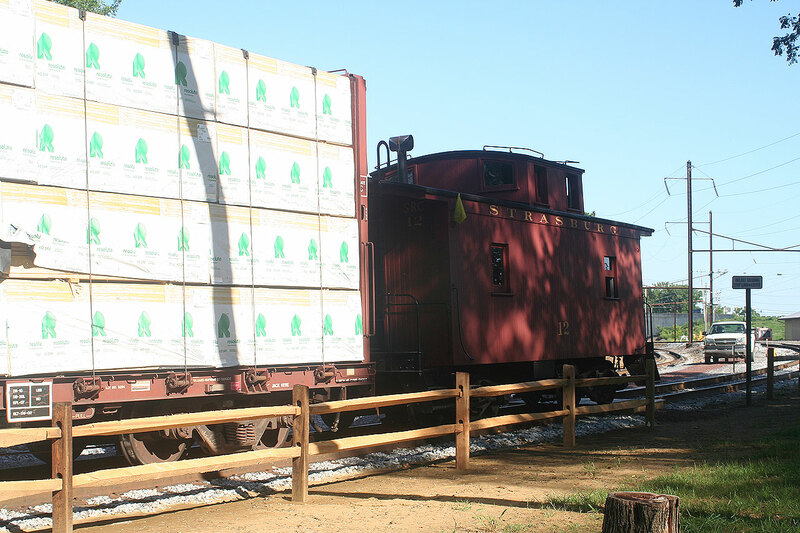 The Strasburg Rail Road has recently (well, in the past 6 years or so) started increasing its freight business. 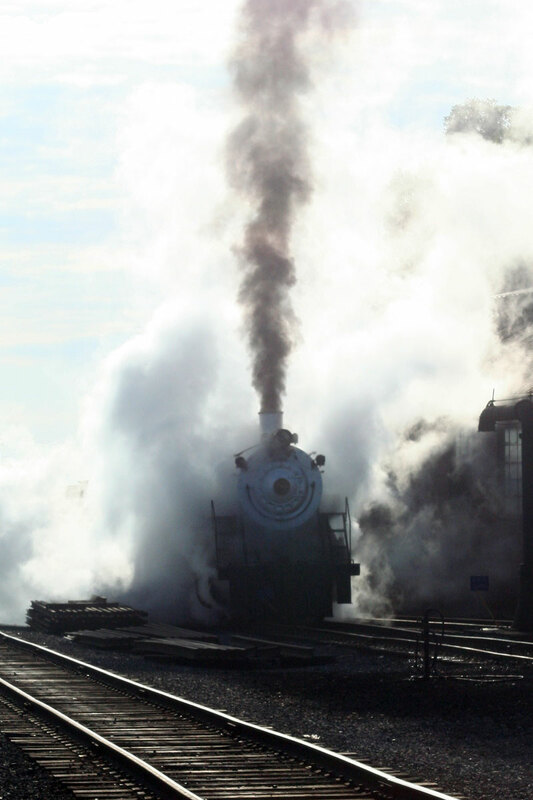 Knowing how to put on a good show, they offer tickets to ride the (usually) steam powered morning freight runs. These tickets made a perfect present for my dad, who got me hooked on this stuff by taking us on monthly pilgrimages to Strasburg when I was growing up. These are the photos from that day. It took a little bit of work to pull the trip off. Strasburg isn’t that far from Philly (where my parents live) or Baltimore (where I do), but the train departs pretty early, so we wanted to get a nearby hotel so we’d be well rested. This proves difficult, however, because the train doesn’t always run, and there’s short notice about when it will. Because of this, our initial plan had to get pushed back by two weeks, but it worked out well, because we ended up with a beautiful day for it. The engine crew gets 90 ready for the day’s work. The “mixed” (just a caboose hop this morning) prepares to depart for Leaman Place Junction. “Tickets” came in the form of handing the conductor your cash (it’s cash only… they joked that it’s actually the crew’s beer fund), and climbing on board. Keeping track of the passengers isn’t hard. On our trip, I think there were six of us. 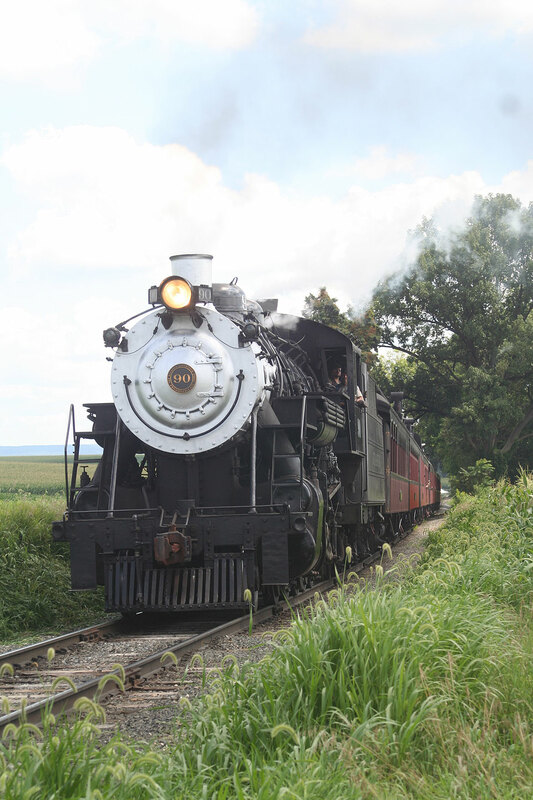 This was great, because we got a chance to talk with the conductor as we were riding out to the interchange. 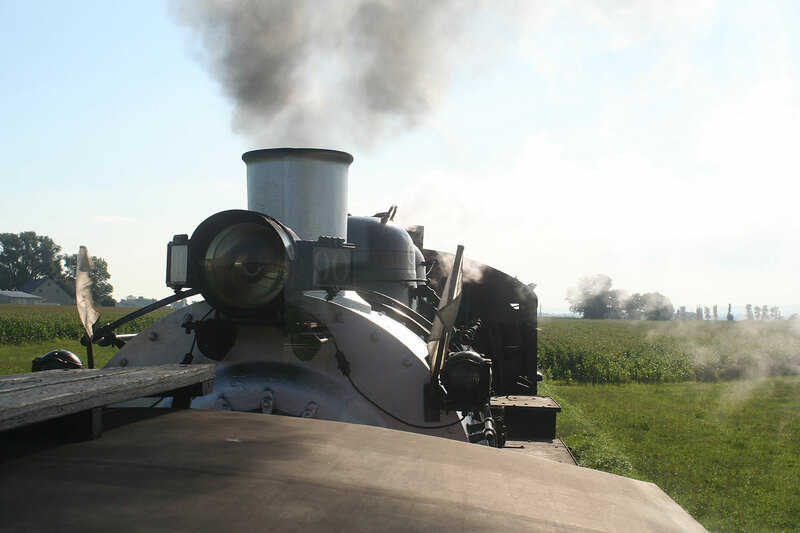 We also got to take turns riding in the cupola of the caboose. I want to say I was cool enough to not geek out about it, but I can’t. The view didn’t hurt either. 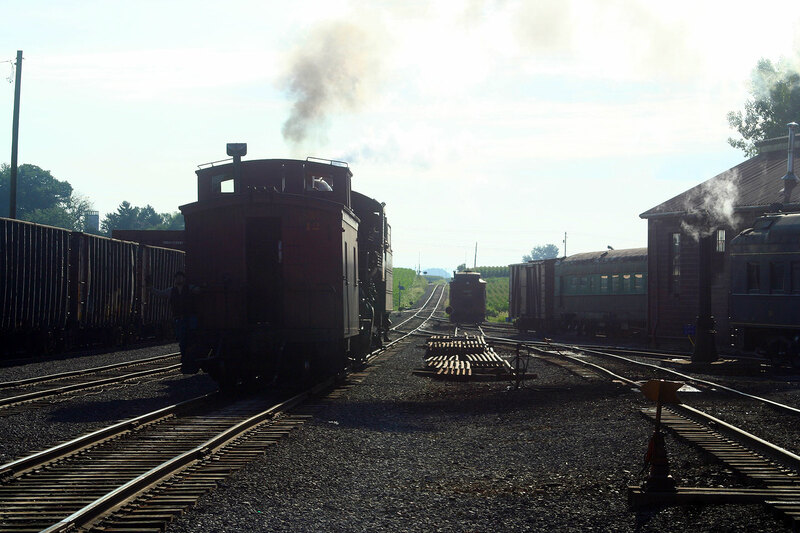 We got to ride in the cupola of the caboose while riding out to the interchange. This view beats the pants off of riding in a coach. 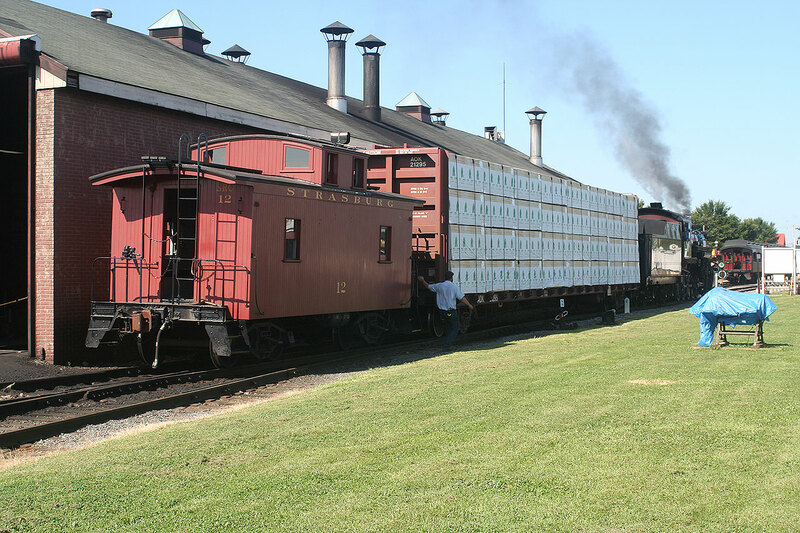 Eventually we arrived at Leaman Place, where the crew set the caboose out, let us out, and then picked up the cars from the NS interchange. 90 backs toward the actual interchange tracks. 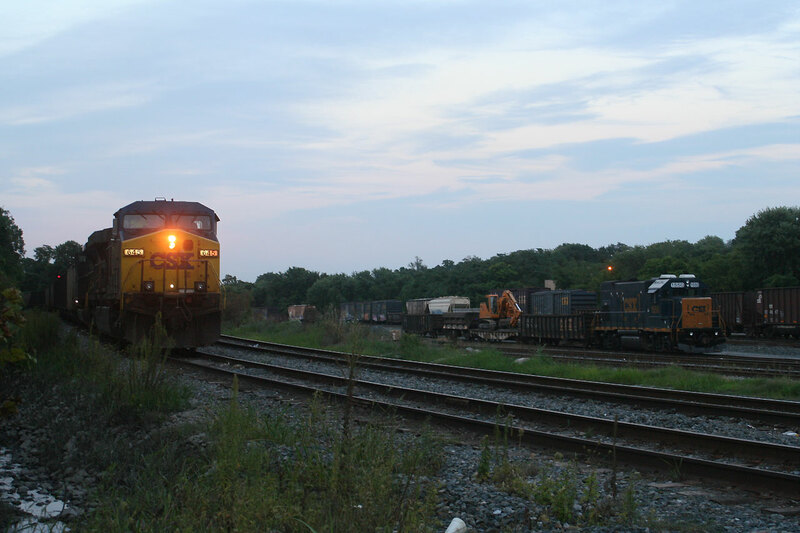 We saw two trains pass while we were waiting for the crew to make the actual pickup. One of them was Amtrak. Even better was catching the NS local returning to Lancaster. 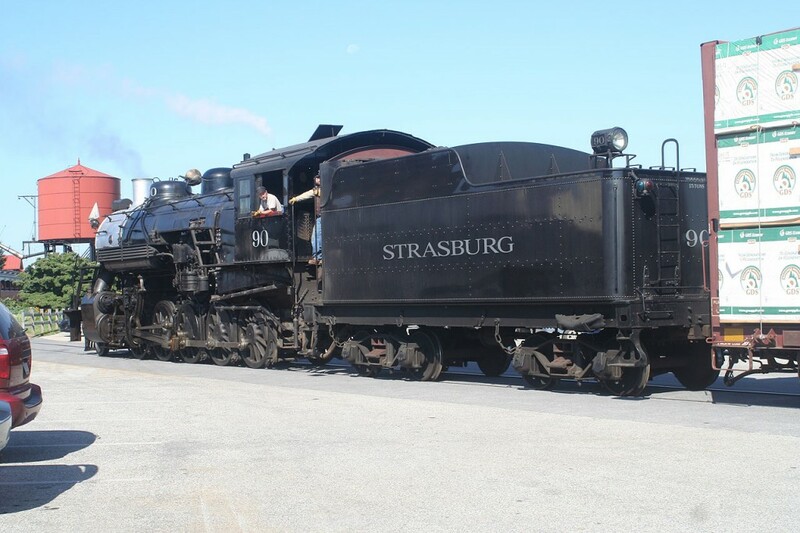 This was probably the train that had dropped the cars off for the Strasburg earlier that day. 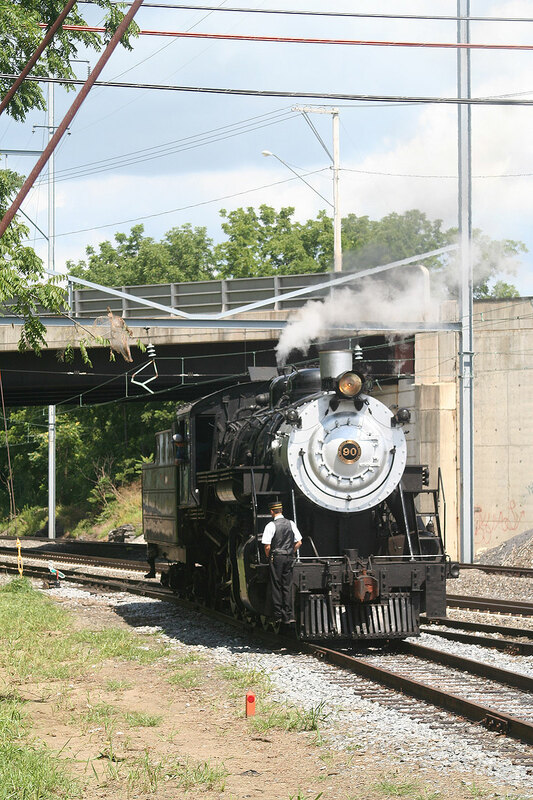 As the Strasburg crew worked on getting the train together, the NS local flew by returning to Lancaster. The NS local speeds past 90 on its way back west. 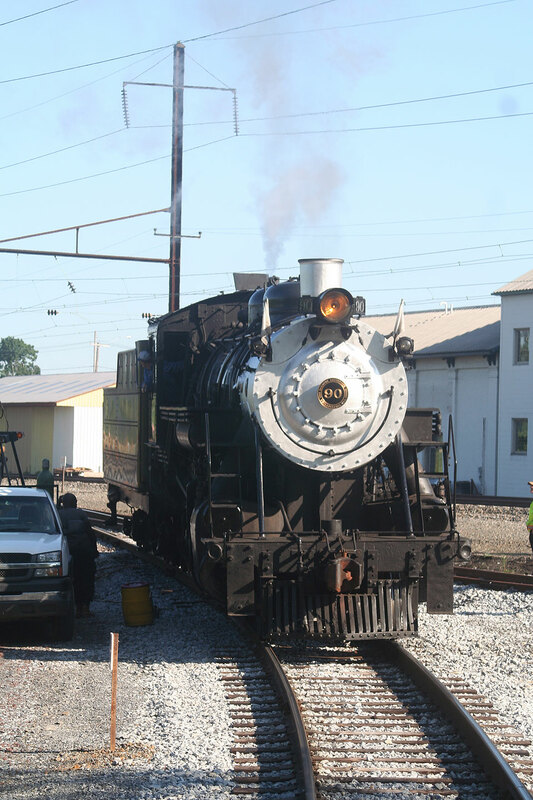 Once the cars have been retrieved, the Strasburg crew worked to put the train together for the trip back. Modern cars seem so out of place on the Strasburg. 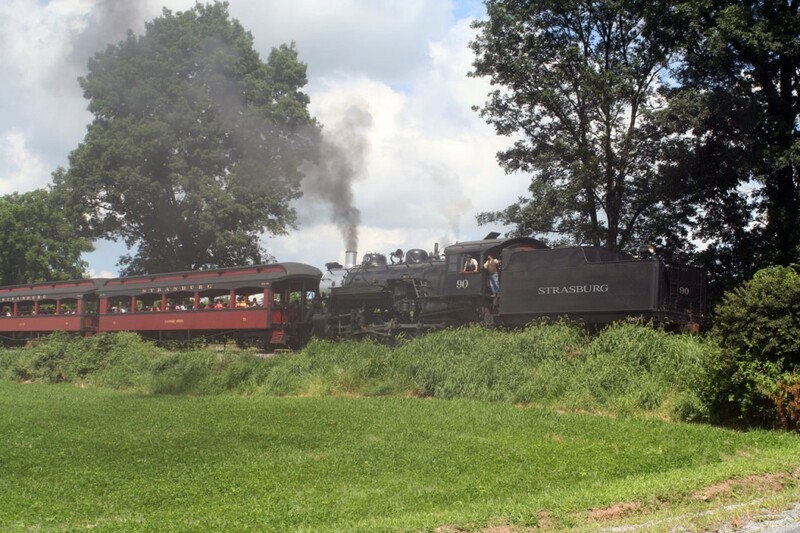 Even stranger than seeing the modern cars on the Strasburg is seeing them coupled to the vintage equipment. After the air test was done, we boarded and headed back to the terminal area. 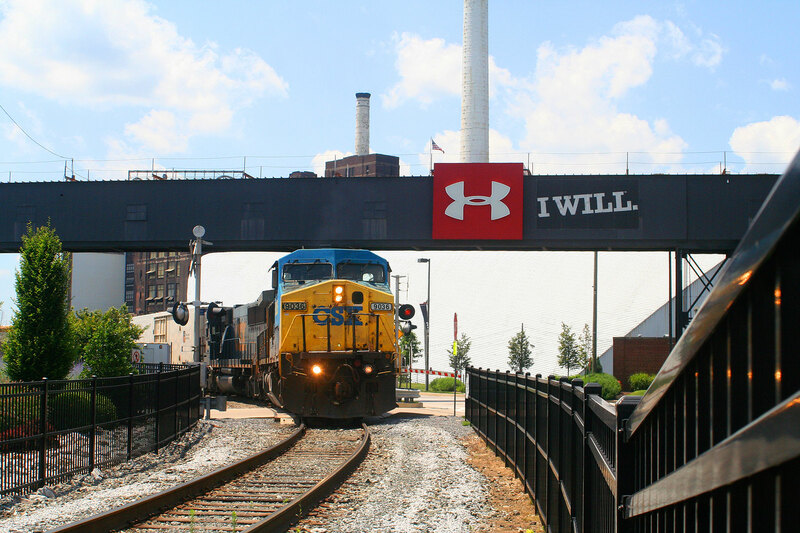 We detrained and watched the crew go to work spotting the inbound car for unloading. 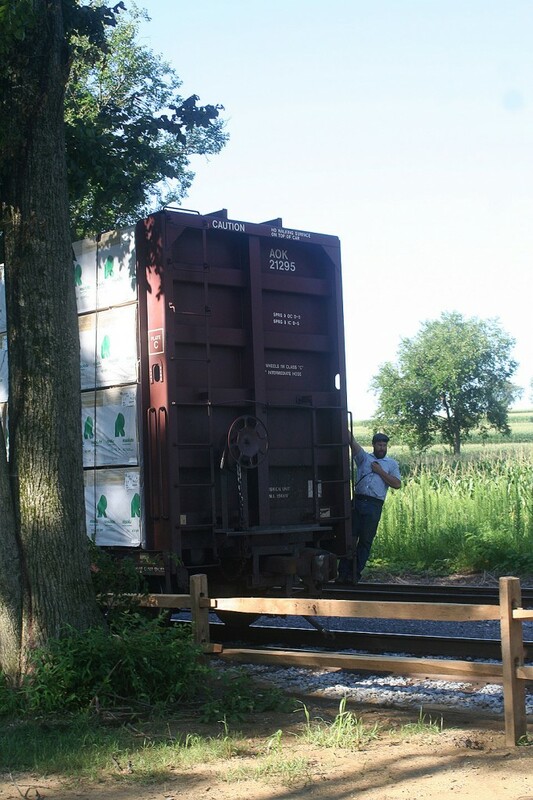 After we detrained, the crew did some switching to spot the inbound car for unloading. There was a bit more switching going on too. 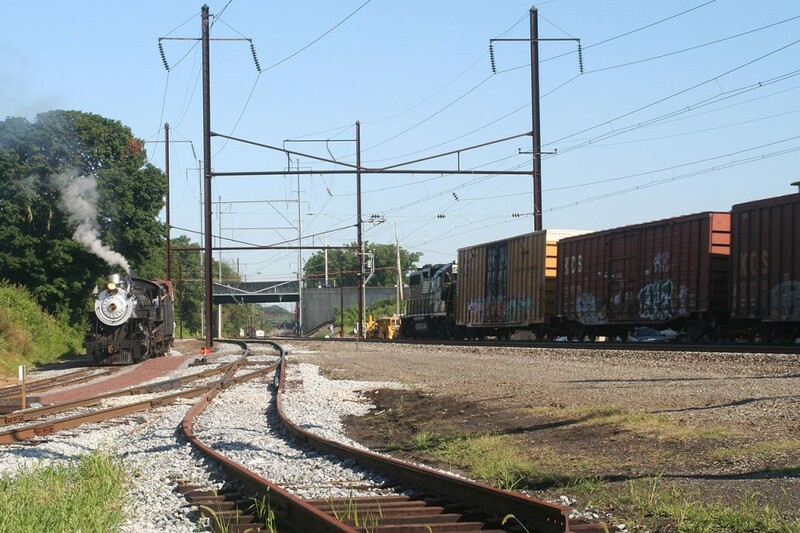 This car was in the way and needed to be moved before the flatcar could be spotted. 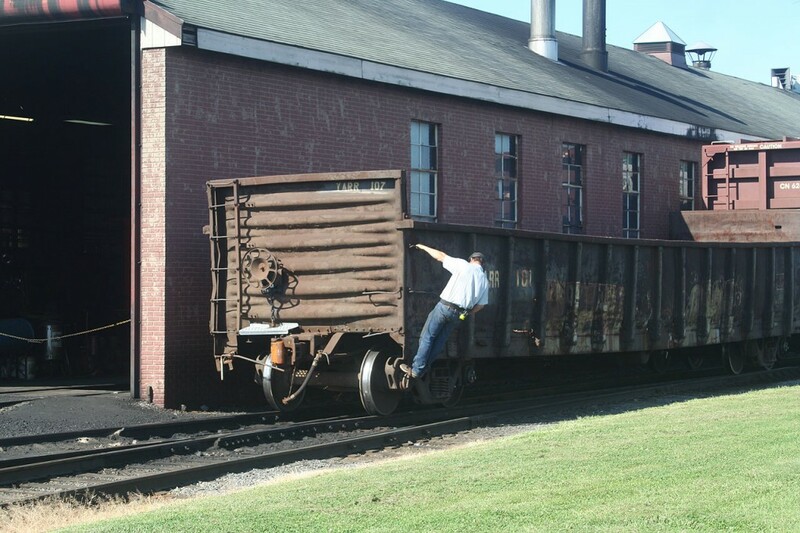 Spotting the flatcar where a forklift could unload both sides. 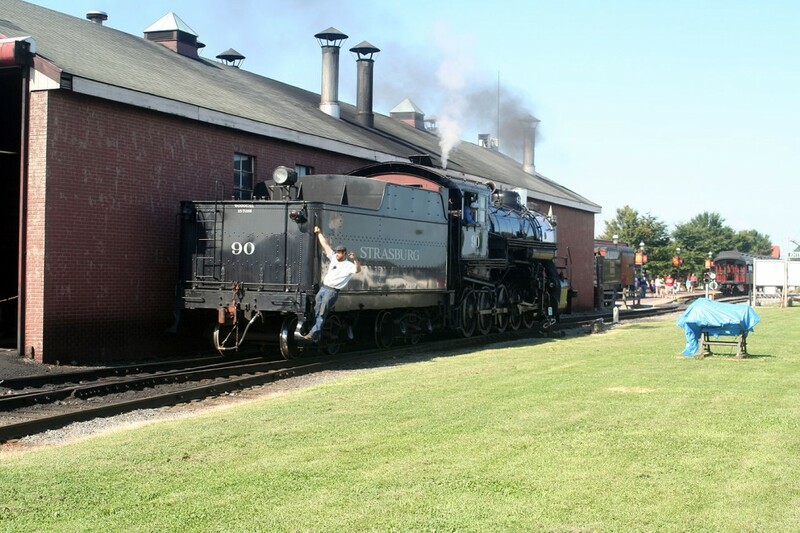 90 looks a lot different than it did in the 80s when it still had its extended smokebox. After the freight business was squared away, 90 switched over to its primary job: hauling tourists. 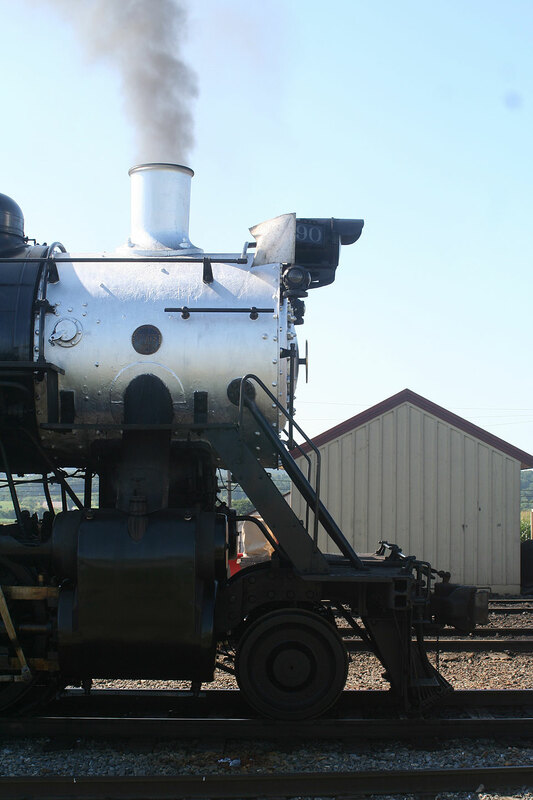 My dad had never actively chased a train, and Strasburg being a good environment for it, I decided to give him another exciting experience: trying to chase down a steam engine and photograph it as many times as possible. I loaded up some chase music in Spotify, and got ready. Our first catch was 90 on its way back out to Leaman place. 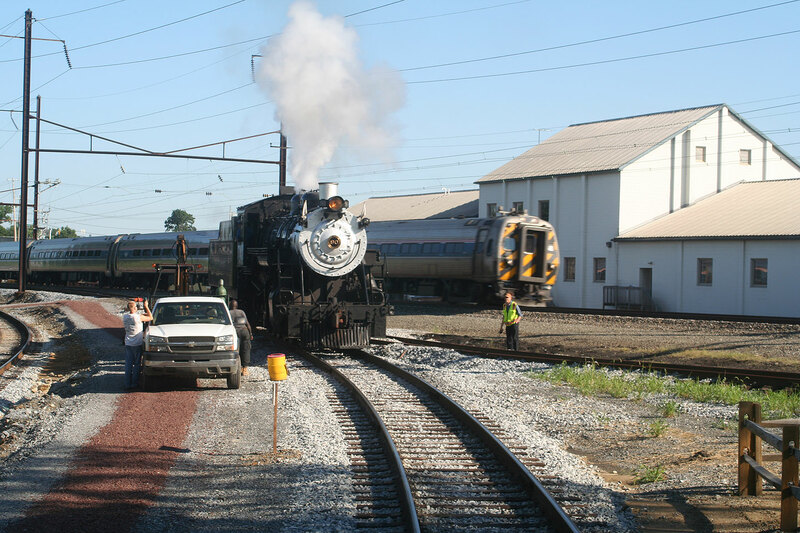 Here it is pulling the train past one of the grade crossings. We returned to the junction to catch 90 running around its train. And one last catch from the same chase: this time with 90 leading its charge. After our chase, we did the noon shop tour, which was also a great time. The people at Strasburg take great pride in their work, and it really shows.